Happy Earth Day Sincerely, Shelbi readers! It's so important to show love to Mother Earth, what are you doing to celebrate? It's important to make eco-choices EVERYDAY, even if it is only turning out your lights and cutting off your television. Going green is good for the planet - and good for for your wallet. Small changes can make a big impact. So these are some of my favorite products that just so happen to be Eco-Friendly, allowing me and the Mother Earth to enjoy them! 1. Nellie's Laundry Detergent - Nellie's Detergent has been green much like Birkenstock's in the event that they were going green long before the color was cool. Nellie's is a hypoallergenic and biodegradable detergent that helps to keep the environment as spotless as your clothes! 2. Honest Co. - Healing Balm - With all of my friends having babies the one thing I am always hearing is that you can never have enough diaper rash cream, and diapers. And while the whole cloth diapering is admirable, I am not sure that you save much time and the ick factor gets me before I even begin! So, since I am such a fan of a celebrity with a meaning, this product really shines the light. Jessica Alba is the founder of this company and has done a great job with each and every product! This Healing Baum is not only for diaper rashes, but can be used to treat eczema, cuts and bug bites! 3. West Paw Dog Bed - With Dally being such a big part of my life, being a pet parent isn't always easy. I have to find the best most effective way to pick the right beds, food, collars, bowls, toys etc. and with this 100% organic bed and it being completely washable, it makes it that much easier for me to tell you this is the only way to go. Though, I am bias... I think everyone should at least check them out. 4. Rachel's Greek Style Ginger Yogurt - For most of my cooking needs I will use a store brand greek yogurt, but as of recently I can't seem to stay away from Rachel's. Though it is not sold in typical grocery stores, it is very popular. A little tip - if you freeze them, they tend to taste like a delicious ice cream! 5. Birkenstock's - Birkenstock has been around forever, never focusing in on the Eco- Chic side of the department store, yet solely striving for Eco-Authentic. This product allows you to express your outdoorsy side and still be able to look fashionably appropriate. I truly love this brand. 6. ZJayne - Dryer Sheet Alternatives - NOW, as I like to point out... I love a small company that really knows what they are doing! And though this is just an Etsy shop, I truly believe that this girl knows what she is doing! I have attached a link to her shop, and I think you would regret not stopping by! 7. eco4life - Produce Bags (12 set) - Another Etsy store that is loving Mother Earth everyday is, eco4life. The products are priced, packaged and produced perfectly! Making it easier and reusable to help the environment. I have attached a link, check it out! 8. Melissa Joy Manning - Aquamarine Crystal Ring - Knowing that this a higher end piece, everyone loves a nice piece of jewelry... who wouldn't want to be economy-conscious when purchasing? I would love a piece like this and until the day comes that she will sit on my little hand, I will continue to stop and stare! A great piece, for a bike ride to dinner into the city. 9. Mrs. Meyers Clean Day - Everyone of these products I am truly in lust with. The smell is overwhelmingly decedent and the uses are endless. There is never I time that I do not have at least one of these items in my home. They are newer to the market but the fact that they are Environmentally Safe keeps them from staying on the shelf! So even if you are doing the slightest as to changing your soap, the smallest bit helps! 10. Pacifica - Hawaiian Ruby Guava Perfume - Growing up playing princesses made it easy to fall in love with a beautiful perfume, but who would have thought that it wasn't going to smell like hemp or bees-wax? This really does make you feel like an Economy Princess! 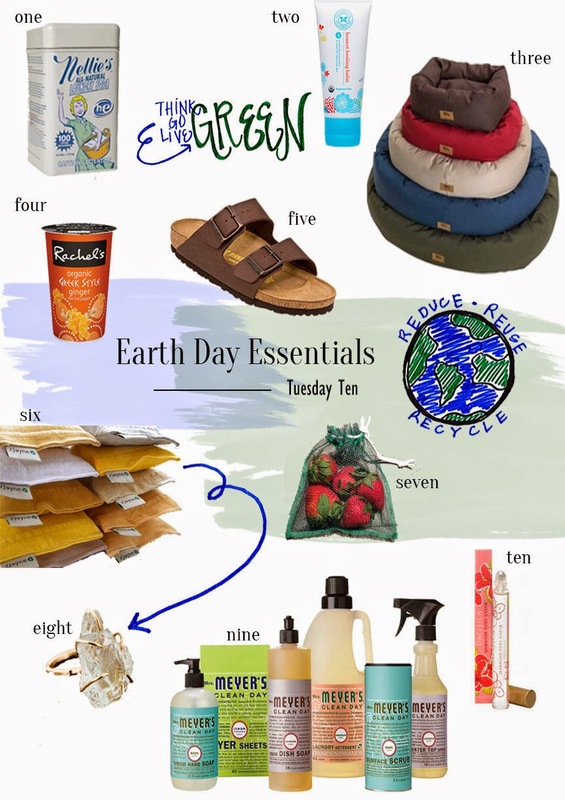 It's not that hard to turn clean into green... What are you going to to do this Earth Day?